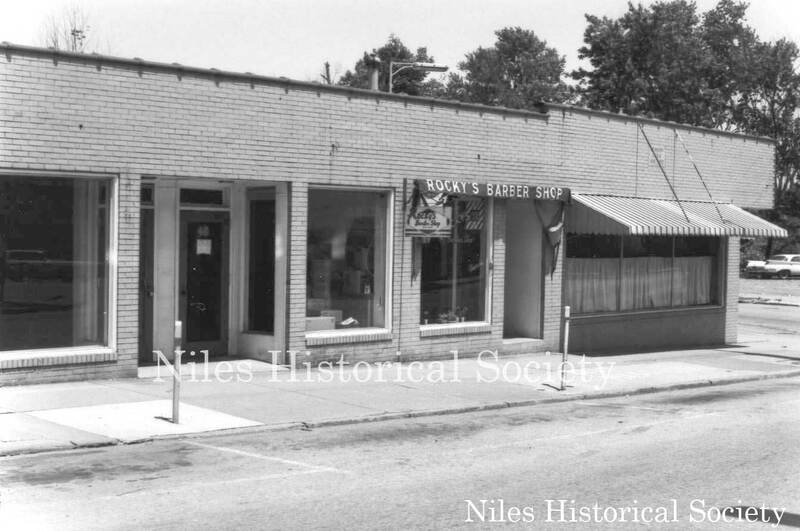 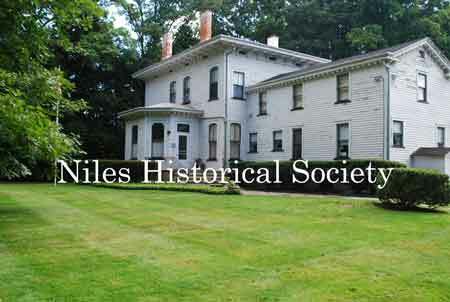 While the residential areas of Niles were expanding rapidly after World War II, the downtown area in the 1950’s remained much the same as it had been in the 1930’s and 1940’s. 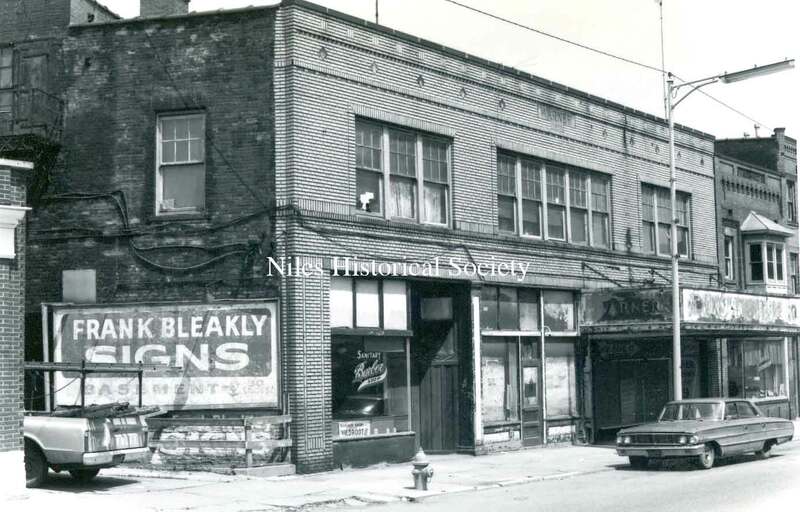 Once a thriving business community, the downtown area began its decline in the 1930’s. 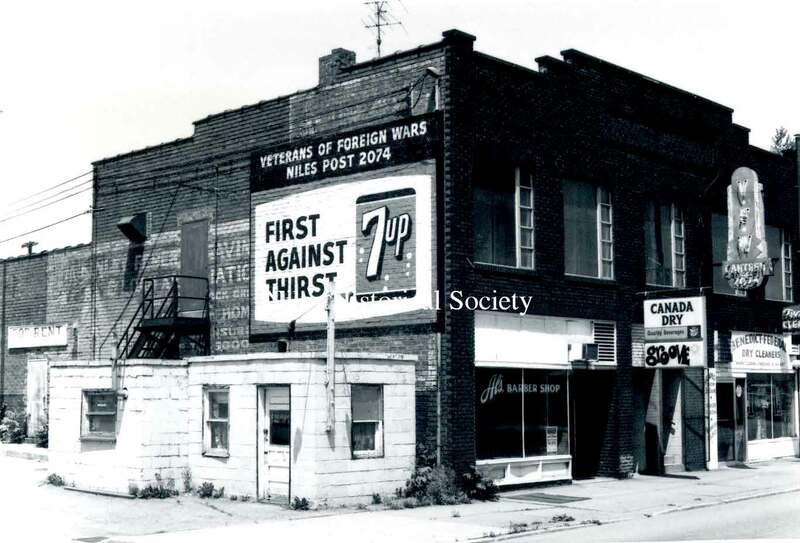 The Saturday night shoppers who crowded the downtown streets had disappeared and much of the sense of community that had highlighted the city’s history was lost. 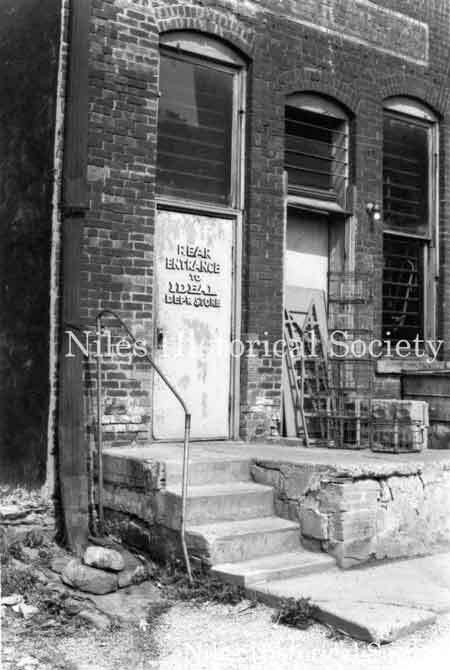 The Hoffman Store fire of 1962 was a real tragedy. It marked the beginning of the real decline of the downtown area. 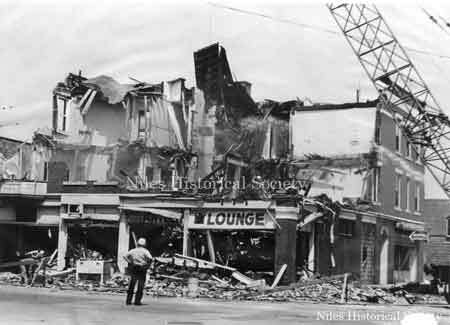 Because of the fire, adjacent buildings, Ragazzo’s and Pritchard’s had to be torn down due to smoke and heat damage. 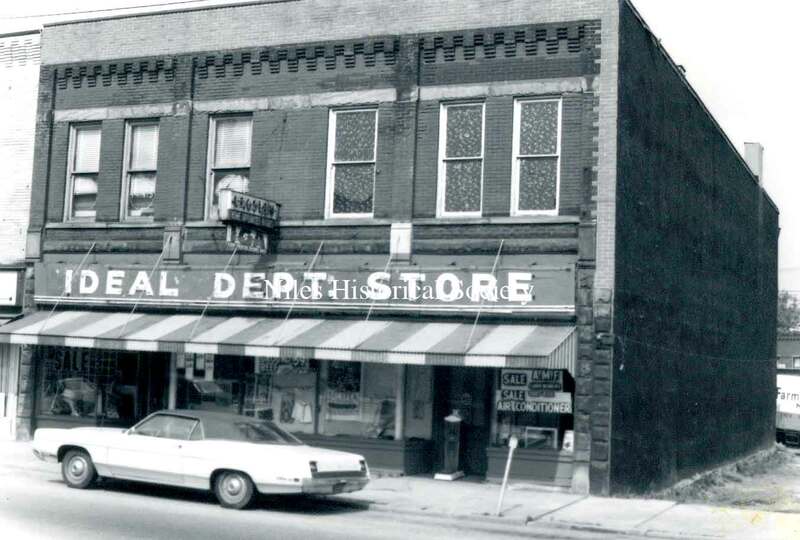 Years of planning under a federal urban renewal program has transformed the downtown area. 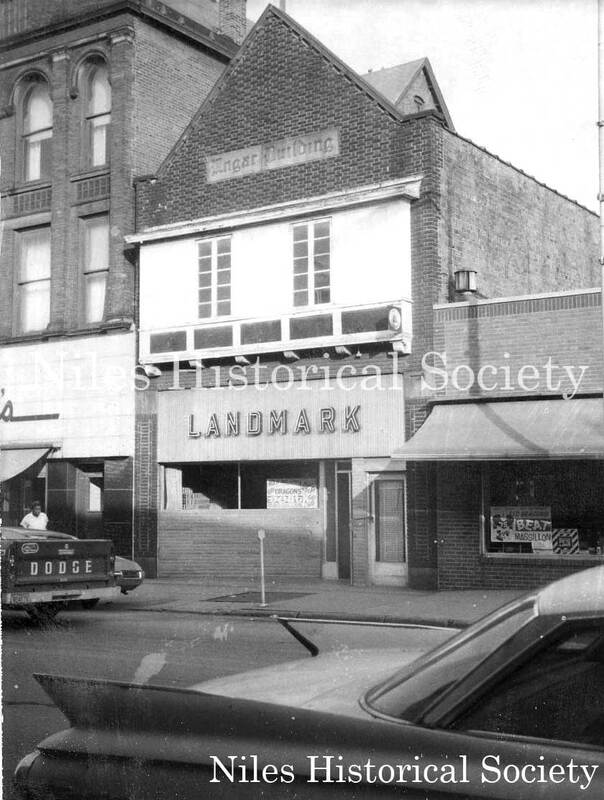 By the end of 1976, the business district that had been laid out by James Heaton has been almost completely razed. The local businessman is gone and little retail business exists in downtown Niles. The construction of Strip Malls in McKinley Heights(1950s), The Village Center Plaza(early1960s), and the Eastwood Mall(late 1960s) offered shoppers access to larger retail stores with parking outside of the downtown area, this hastened the demise of the downtown. 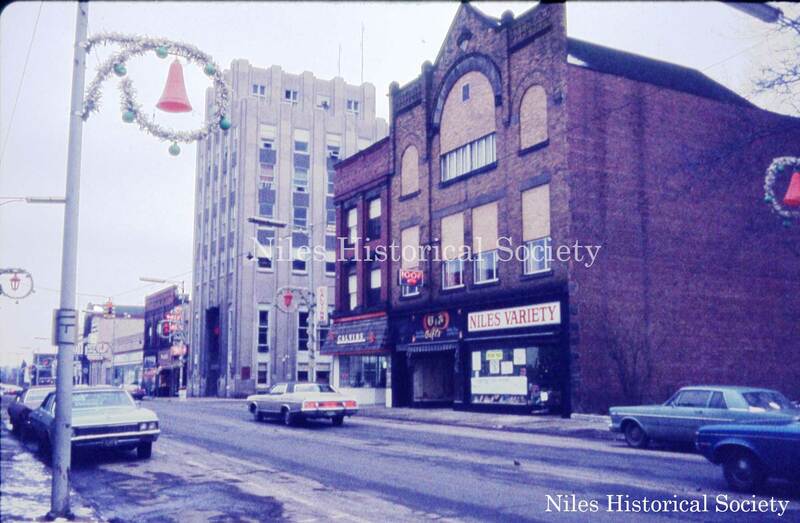 In 1976, work under the Federal Urban Renewal Program began to transform the downtown area as buildings built in the late 1870s - 1950s were demolished. The Niles City Police and Fire Departments were relocated to the new Niles City Municipal Building on State Street which included a new jail and Municipal Court facilities. With the demolition of the buildings on State Street, the street itself was moved east closer to Mosquito Creek providing additional space between North Main Street and East State Street. 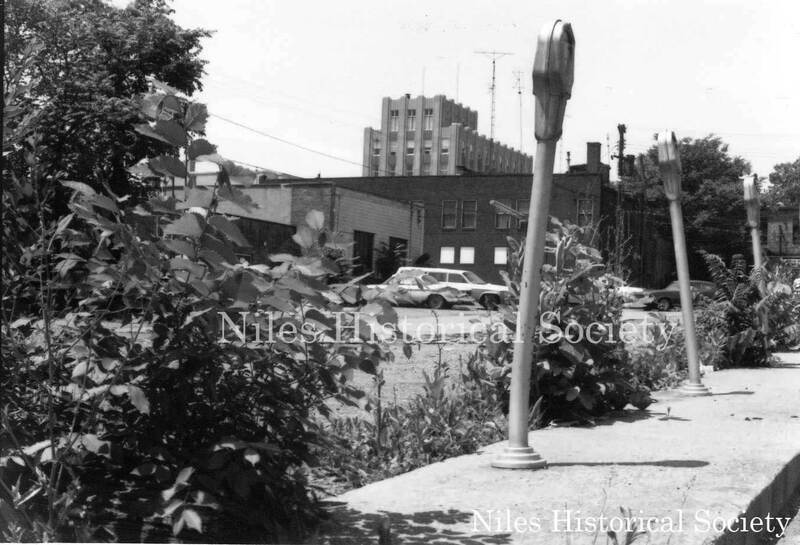 A new one-way street between East State Street and East Park Avenue provides access to downtown buildings and egress for fire department trucks going out on a call. 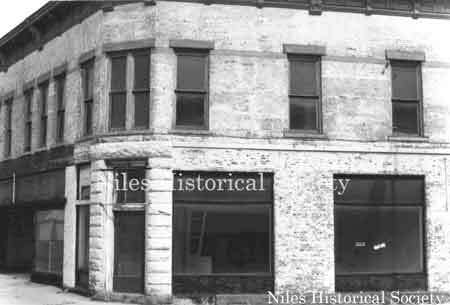 Except for the west side of Main Street, no buildings predating 1910 remain in the downtown area. 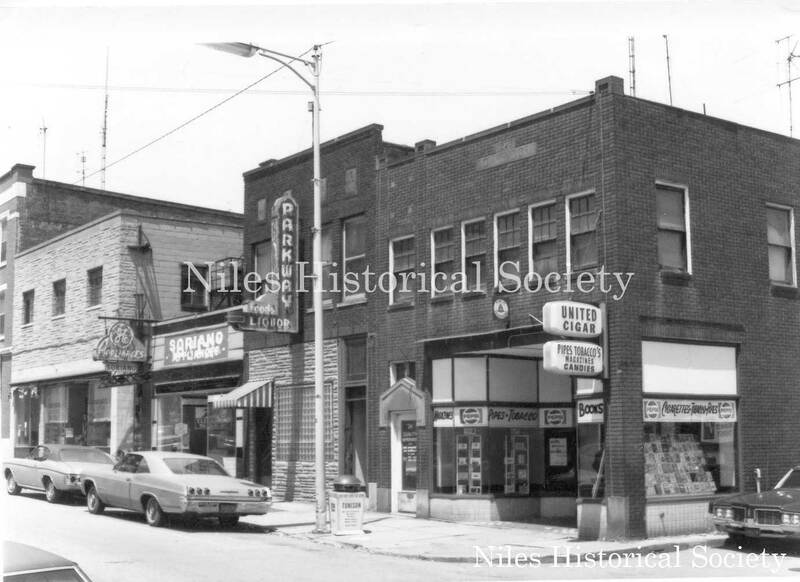 The following graphic photographs were taken to illustrate the condition of the buildings on State Street, East Park Avenue, and Main Street. 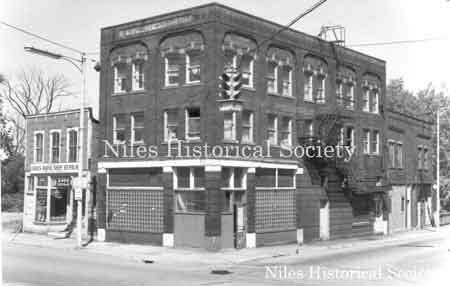 The images were used in the application for Federal funds to demolish old buildings so that modern business facilities could be constructed. 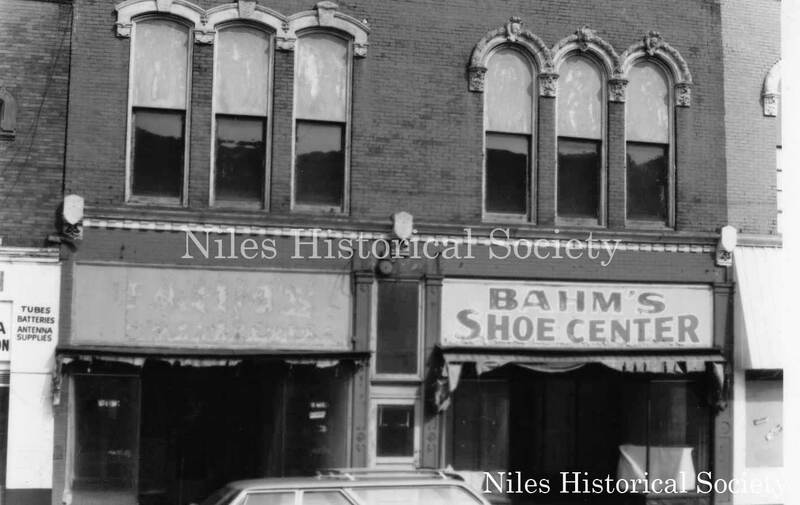 Photo taken of the Bahm Shoe Center located at 43 East State Street, Niles. Formerly a department store. The State Liquor Store, Little Annies' Inn and Amvets were located on the west side of State Street. 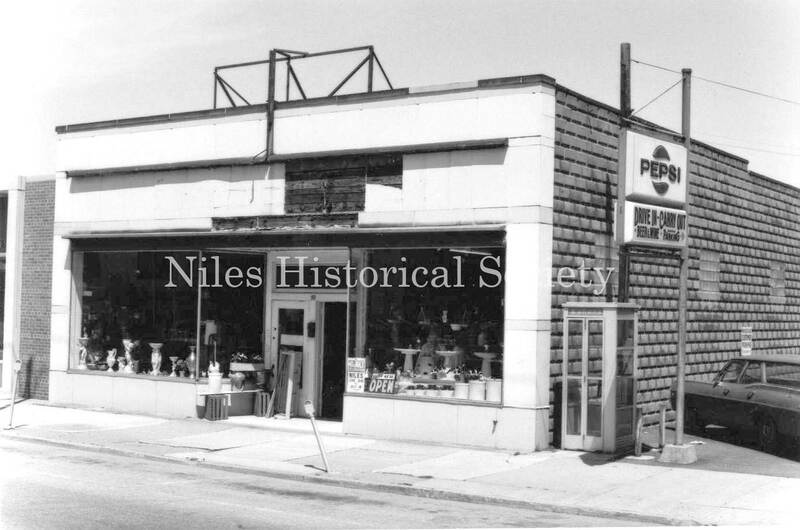 Photo taken of the north side of East State Street with Jensen's Hardware on the west or inside of bend on State Street. 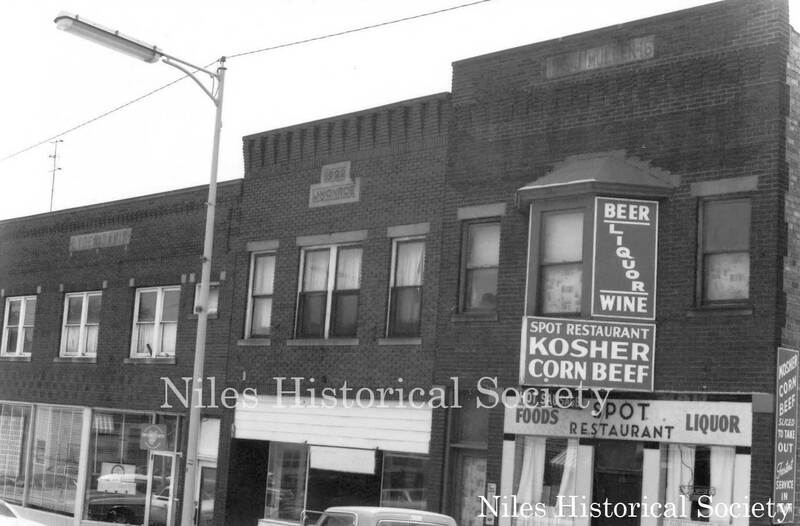 Photo taken of The Spot Restaurant located at 13 East Park Avenue (south side) in downtown Niles before the advent of urban renewal. 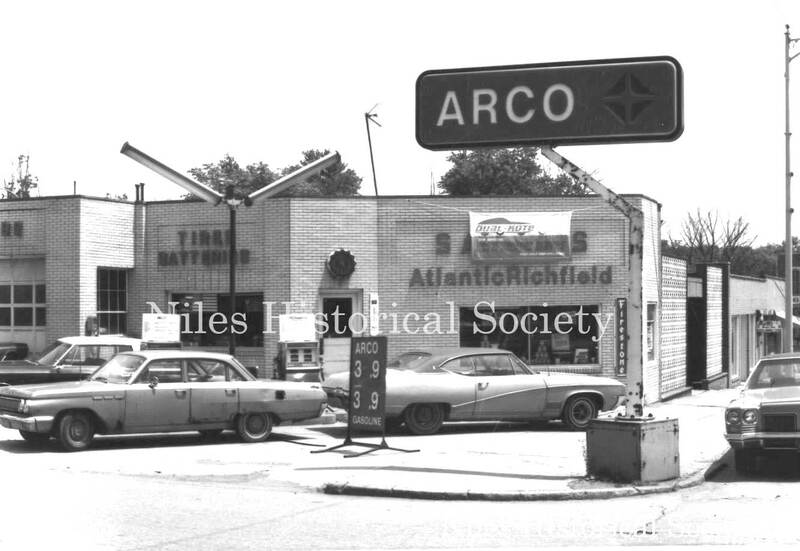 Picture taken of Sam Bernard's gas station located at 32 East Park Avenue(north side) and Pine Alley before urban renewal. 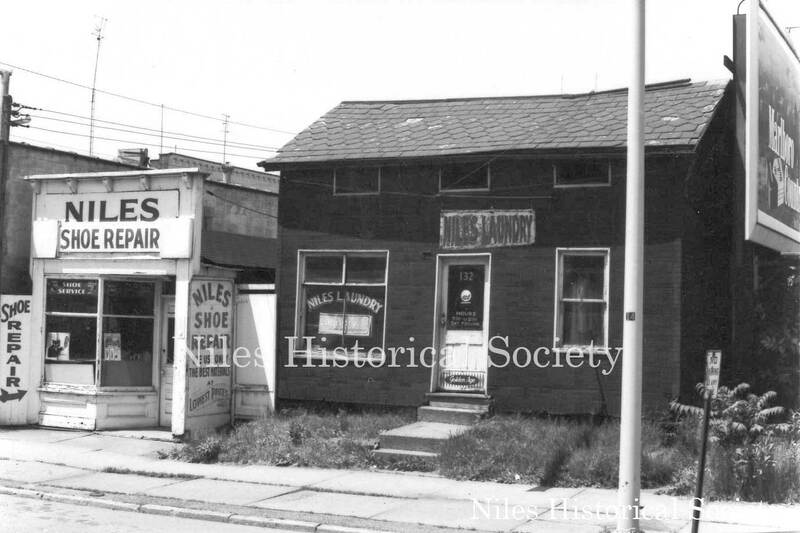 Picture taken of Rocky's Barbershop located at 50 East Park Avenue in downtown Niles before urban renewal. 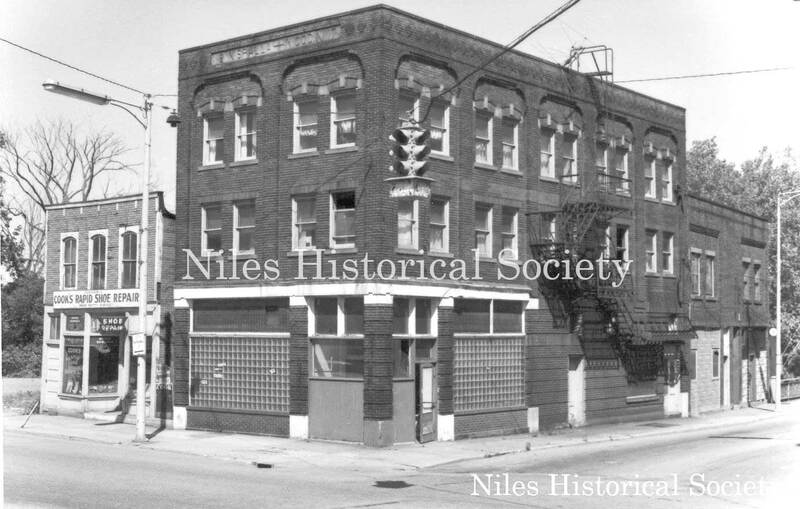 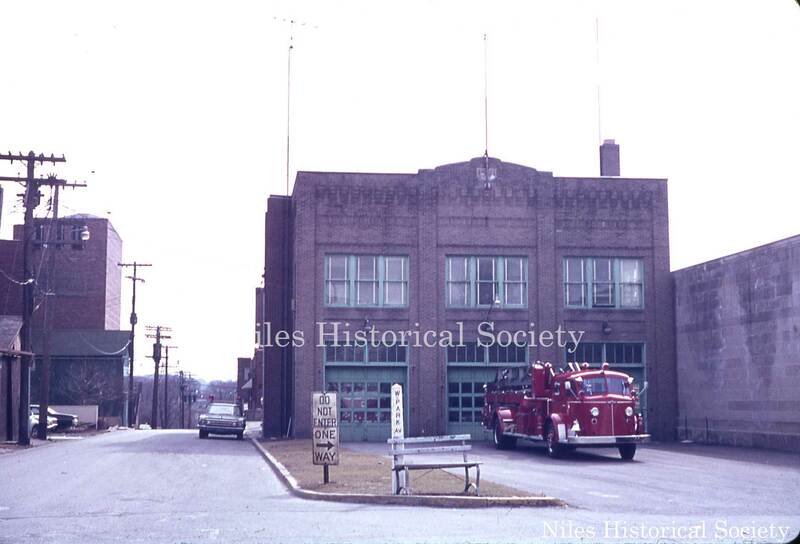 Photo taken of the old Police and Fire Station located on the east side of the Post Office, on West Park Avenue in downtown Niles before urban renewal. 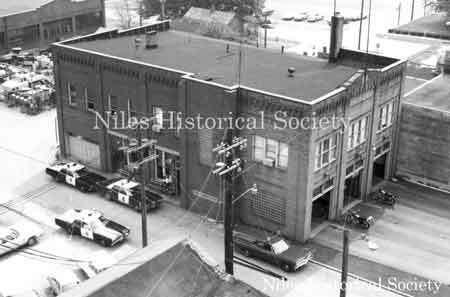 Front view of the old Police and Fire Station from West Park Avenue and Franklin Alley. The final stages of the demolition of the Antler Hotel on the northeast corner of Main Street and East Park Avenue. 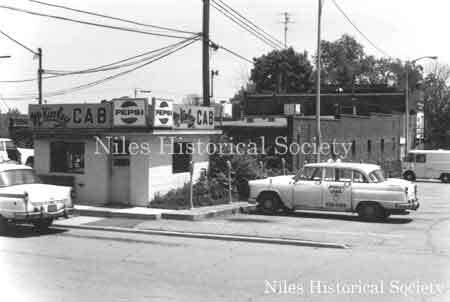 Dated June 1976. 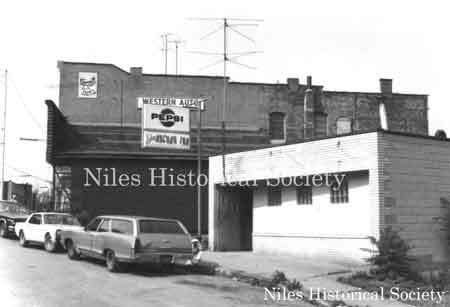 Photo taken of the Anchor Inn and the Western Auto buildings on the south side of East State Street in Niles. 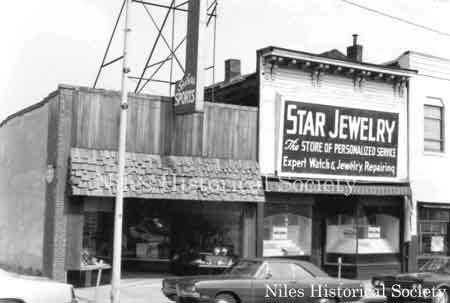 Photo taken of Star Jewelry and Seiber's Sporting Goods located on the east side of Main Street in downtown Niles before urban renewal. Photo taken of J & J Discount Store on the southeast corner of Main and State Streets in downtown Niles before urban renewal. 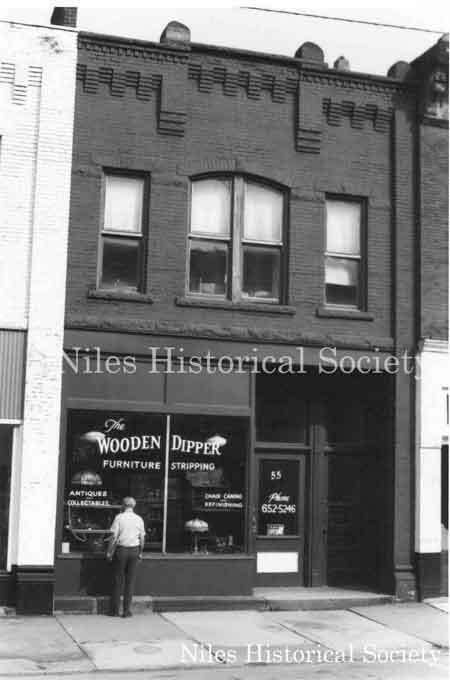 Photo taken of The Wooden Dipper at 55 East State Street in down town Niles before urban renewal. Photo taken of the Landmark Bar located on Lot 1105 in down town Niles. Photo taken of the rear entrance to the Ideal Department store. 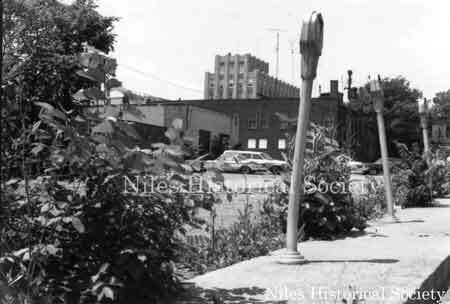 View from Pine Alley. 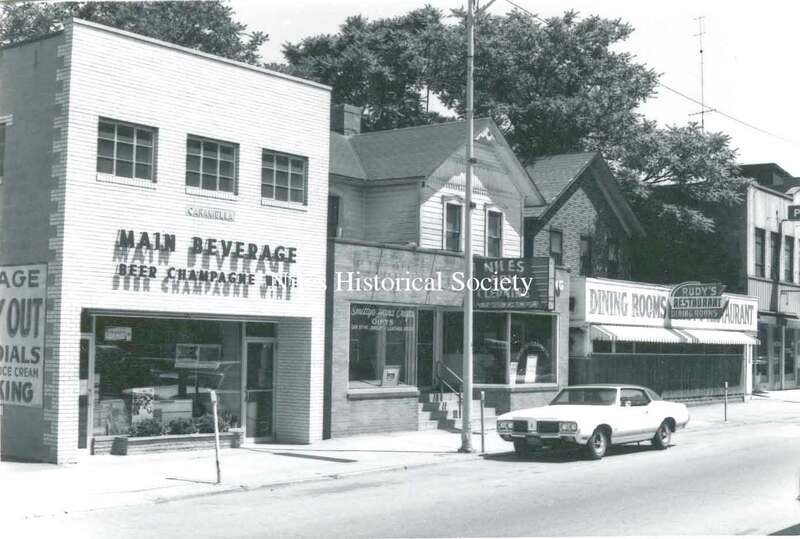 Photo taken of Main Beverage located at 31 North Main Street, Niles Dry Cleaners, Rudy's Restaurant, Pugh Hardware in downtown Niles before urban renewal. 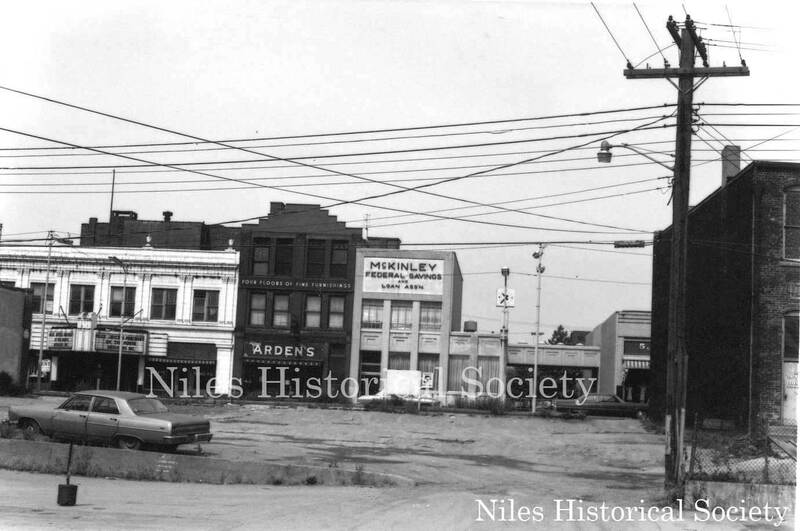 Photo taken of McKinley Federal Savings and Loan, and the Arden Building, (also The Old Main Ale & Chowder House) located on the site of the McKinley home in downtown Niles before urban renewal. 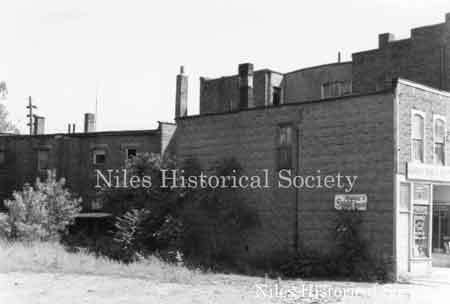 The Arden building and the bank have been razed to make way for the replica of the McKinley Birthplace. 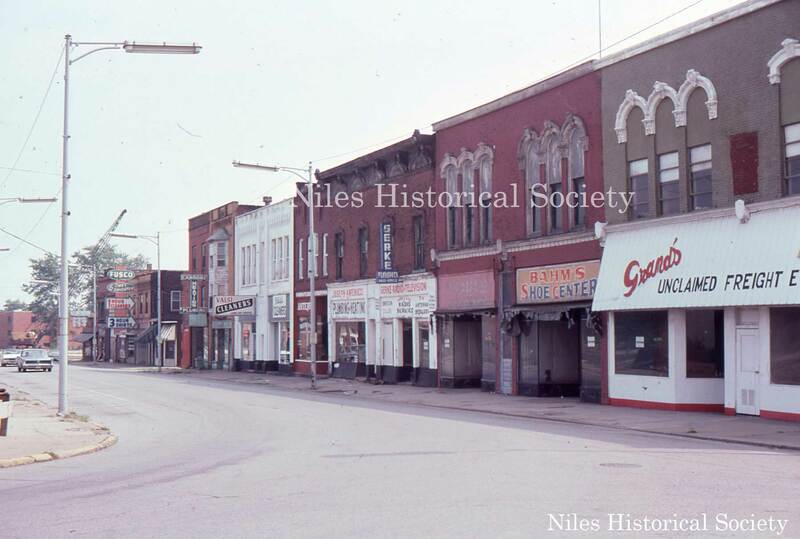 Looking north from the curve on East State Street. 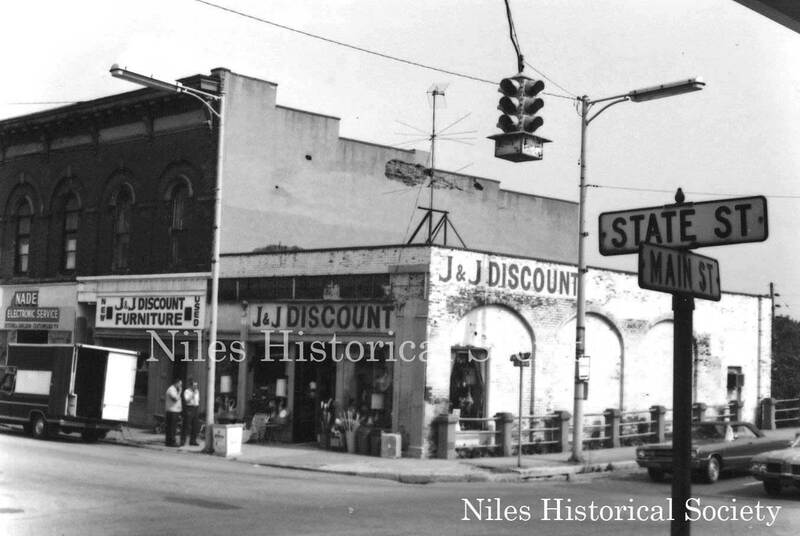 Grand's Unclaimed Freight, Bahm's Shoe Center, Gerke Radio & Television, Joe Antenucci Plumbing, Antique Shop, Valsi Cleaners, Lou Carbone Plumbing, and Fusco Dry Cleaners. 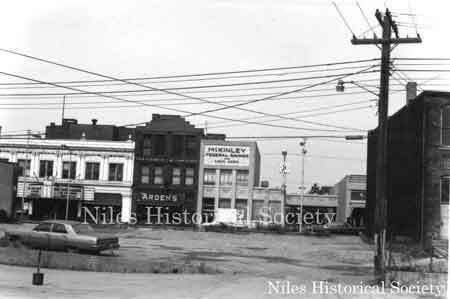 All these buildings were demolished during urban renewal. 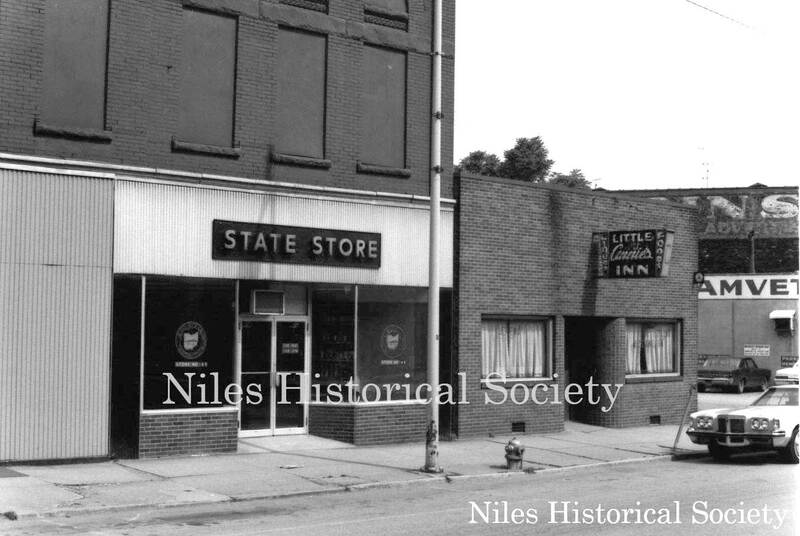 Photo of former state liquor store on North Main Street, Niles before urban renewal. 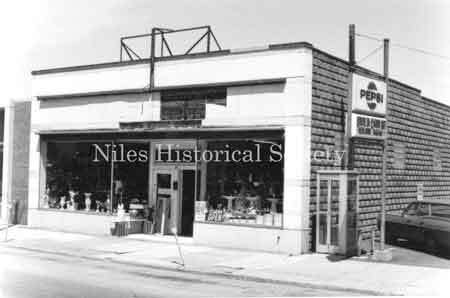 This building also was the location of The Firestone Store in the late 1940s-1960s. Photo taken of Cook's Rapid Shoe Repair located on the south side of East State Street in downtown Niles. Niles' Central Park was on the left of this open area. View of the IOOF Building and Calvin's Drug Store at corner of North Main Street and West Park Avenue. 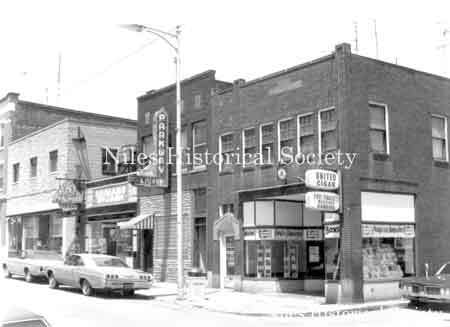 All buildings at this corner have been demolished. Photo taken of parking meters used in the city parking lot before urban renewal. 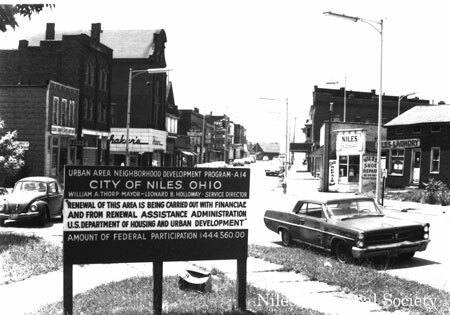 The Niles Bank Building rises on the skyline in the center of picture. 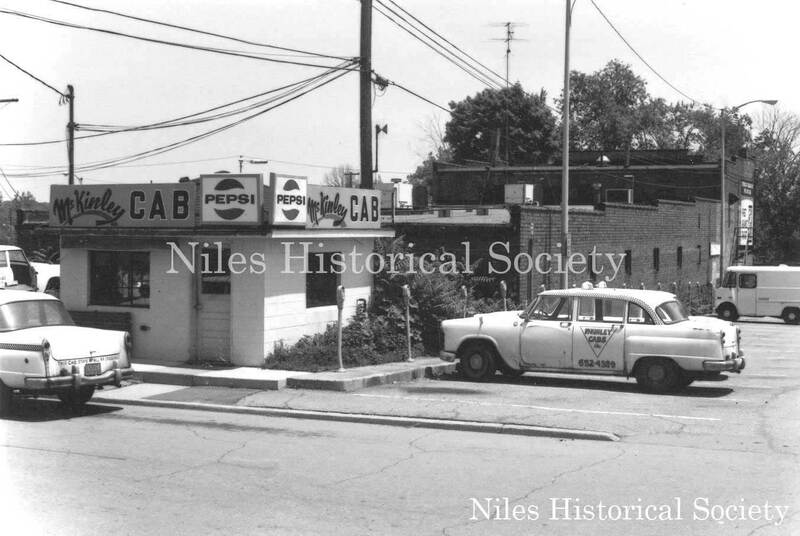 Photo taken of the McKinley Cab Company located at 449 Pine Alley in downtown Niles before urban renewal. 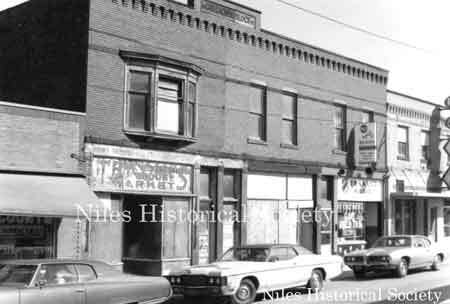 Photo taken of The United Cigar located at 28 East Park Avenue on the corner of Park and Pine Alley in downtown Niles before urban renewal. Photo taken of Frank Bleakley's Sign Company in the basement of the old Warner Theatre Building on State Street. Photo taken of the old bowling alley, 162 East State Street, down town Niles. 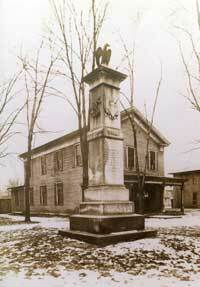 The Veteran's of Foreign Wars are located upstairs. Note also Benedict Dry Cleaners next door. Photo taken of the Ideal Deptartment Store located on the east side of South Main Street in downtown Niles before urban renewal.